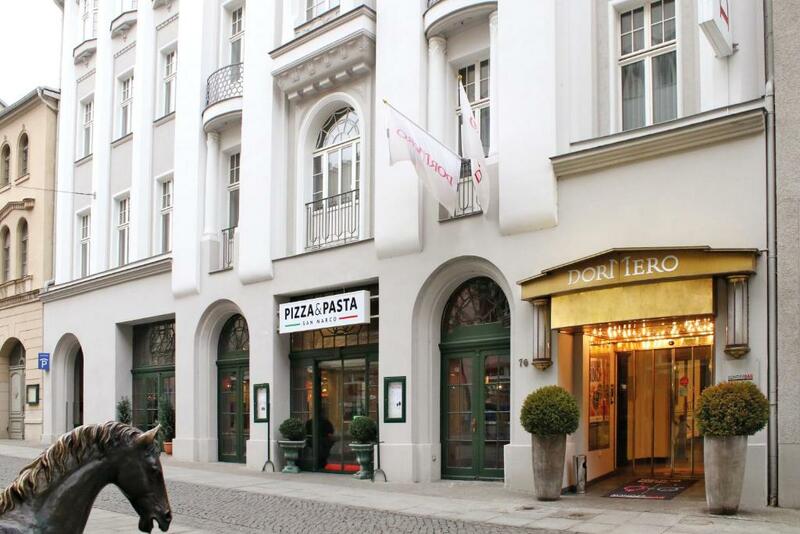 Lock in a great price for DORMERO Hotel Halle – rated 8.2 by recent guests! It's a very nice hotel. Very friendly, professional and helpful staff. Free drinks in the mini bar was a really nice gesture. 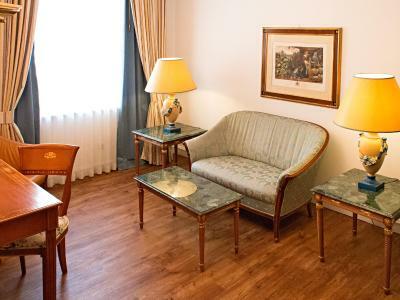 The location is in a short walking distance to the main train and bus station. The location was quiet and close to some nice shops. Highly recommend! Absolutely everything. It's the second time I stay there and again I love it. The bed is so comfortable that it is unbelievable. 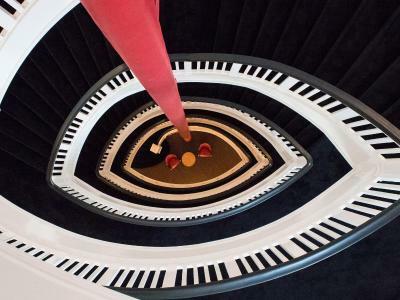 Will definitely chose this hotel for my stay every time. 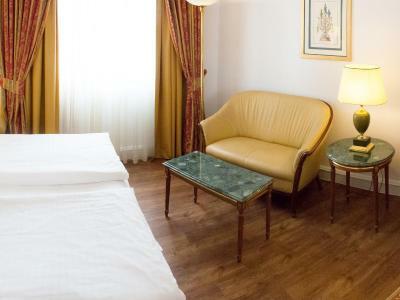 Comfortable bed, friendly staff, convenient location and parking. Bed was comfortable. Having the option of a second pillow would be good. Free drinks in the mini bar was a very pleasant surprise. Overall a nice and comfortable hotel. My daughter really like the fish tank. 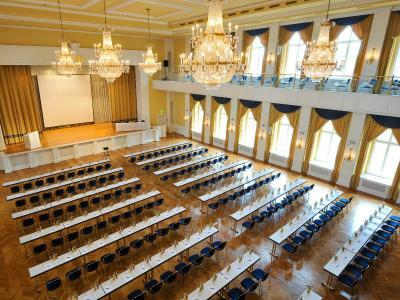 The room was clean and big, free wi fi, nice location! The breakfast is good, as usual the standard stuff, so not really special. The staff is nice. The rooms are clean and (too) big. In a modern new hotel the rooms are half the size. On a business trip you don't need this size. Halle is a really nice city, however not made for the tourist of today. It will hopefully change in the future. Everything perfect. 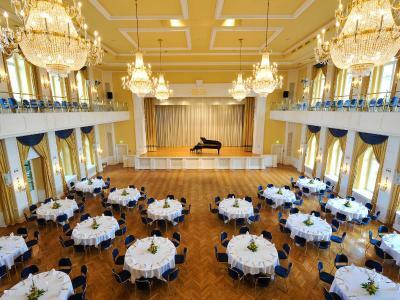 Rooms modern, big and confortable enough. Nice staff and perfect location. The rooms and hallways were decorated in a nice oldfashioned way. Free minibar was nice. There was a good variety of food at breakfast. the bed was comfortable and the movie channel had a good choice of films. 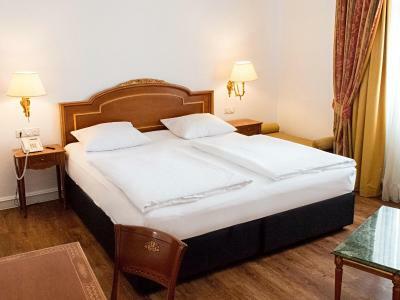 DORMERO Hotel Halle This rating is a reflection of how the property compares to the industry standard when it comes to price, facilities and services available. It's based on a self-evaluation by the property. Use this rating to help choose your stay! 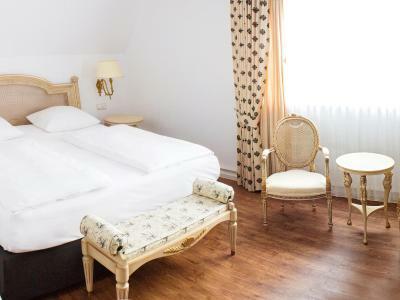 This 4-star-superior boutique hotel in Halle city center offers soundproofed rooms with a free mini-bar, traditional cuisine and free use of the elegant spa area. Halle Train Station is 1,650 feet away. 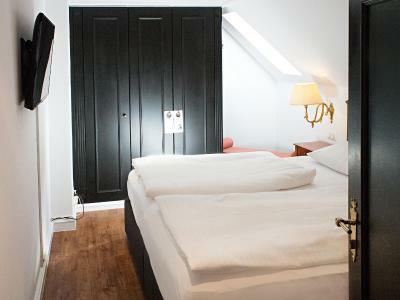 Located in the main pedestrian area, the nonsmoking Dormero Hotel Halle has a Finnish sauna, a hot tub and a gym. 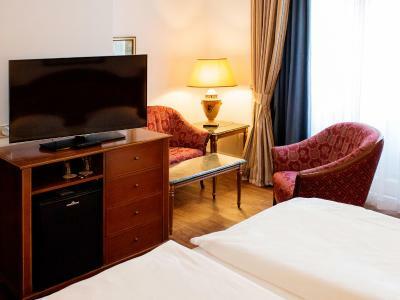 The spacious rooms and suites at the Dormero Hotel Halle feature a safe, free Sky-TV and free Wi-Fi. All bathrooms include a cosmetic mirror, and a bathrobe is available on request. An international breakfast is served daily. There is an on-site restaurant Pizza and Pasta - San Marco. Halle’s historic market square is a 10-minute walk from the Dormero Hotel Halle. 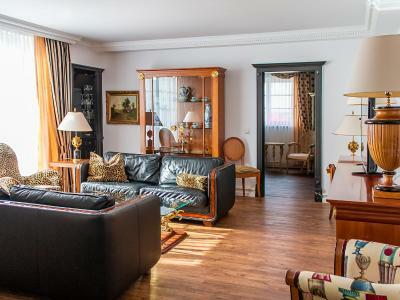 This property also has one of the top-rated locations in Halle an der Saale! Guests are happier about it compared to other properties in the area. 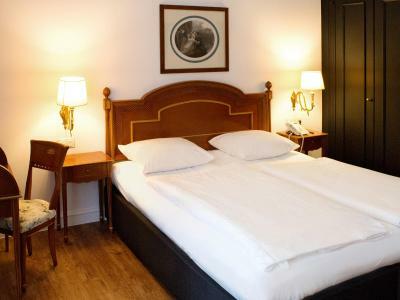 When would you like to stay at DORMERO Hotel Halle? 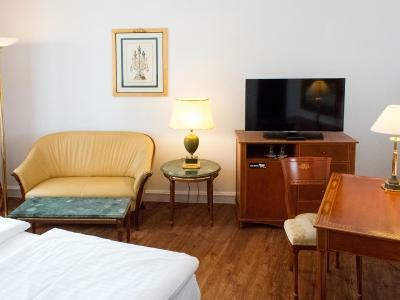 Featuring a free mini-bar, WiFi, flat-screen satellite TV with Sky and international channels and a private Italian marble bathroom with a shower and bathtub. 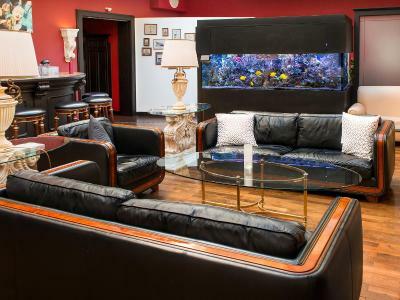 Featuring a combined living and sleeping area, a free mini-bar, WiFi, flat-screen satellite TV with Sky and international channels and a private Italian marble bathroom with a shower and bathtub. 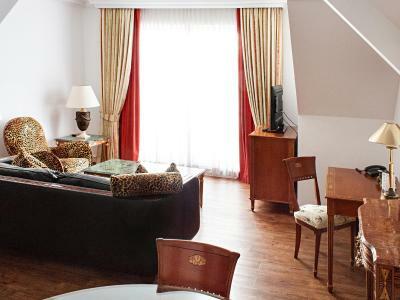 Spacious room featuring a free mini-bar, WiFi, flat-screen satellite TV with Sky and international channels and a private Italian marble bathroom with a shower or bathtub. 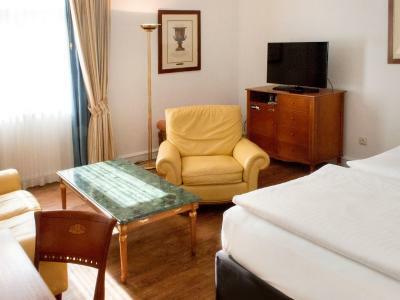 Larger room featuring a free mini-bar, WiFi, flat-screen satellite TV with Sky and international channels and a private Italian marble bathroom with a shower and bathtub. 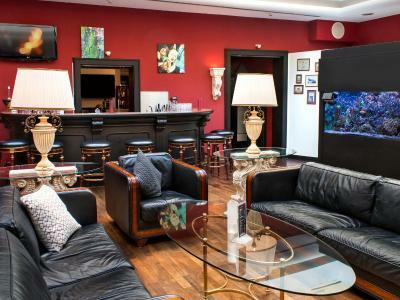 House Rules DORMERO Hotel Halle takes special requests – add in the next step! DORMERO Hotel Halle accepts these cards and reserves the right to temporarily hold an amount prior to arrival. Please note that road access is via Franckestraße 1, 06110 Halle/Saale. Free movie on the TV and free mini bar . 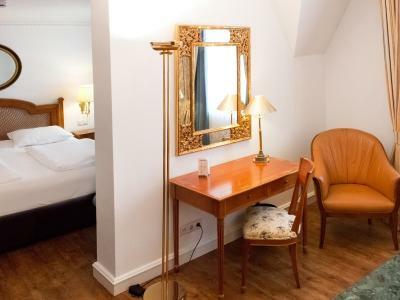 I charged for the room twice i didnt received any refund,lady at reception during my check out do not speaks english only german,guite hard for the tourists,exit from the parking is 16€ but if you pay at the parkomat its 12€! 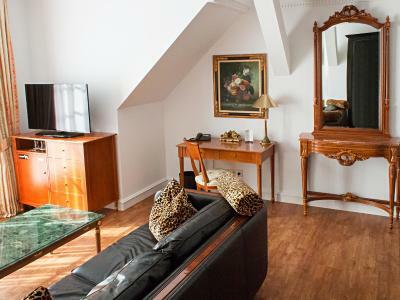 ?....The location is good if you want to stay in city centre,rooms are spacious and clean. 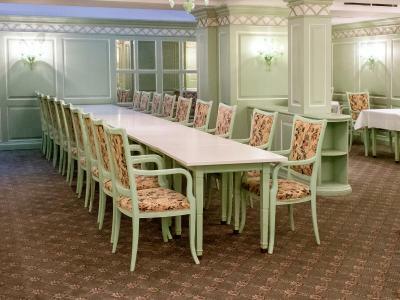 The rooms are maybe a little bit old-fashioned, it's a matter of taste. The concept is a little bit confusing and therefore it's never gonna be a 8 or higher for me. Bathtub was leaking preventing it to be used. Instructions and advertisements tried to be funny but were made with a bad taste. The room was too hot without any possibility to cool down the temperature as the ventilation did not work. No international TV, the fridge did not work properly and the staff was not overly concerned about it. 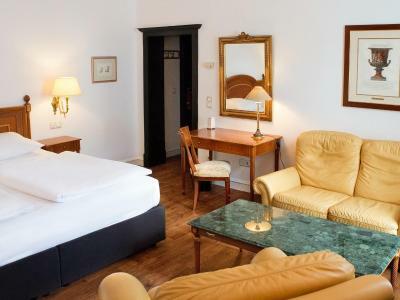 When asking for an extension of our stay due to changes of our itinery, we seemed to have asked in an stressful moment for the staff as we were told we cannot book another room directly at the reception but have to call the central service in Berlin. Once we have called them, they told us we need to make the booking at the reception. Overall, they seemed to be understaffed a bit. No parking available. Cars can be parked in the public carpark next to the hotel but that costs up to 16 Eur per day. The WiFi service is poor; I could not connect either iPhone or iPad. Designed for a comfortable stay. We were told that the cleaners leave at 12am, so our room was not cleaned during our stay (we like to sleep-in). Friendly staff provided the necessary suplies. Bathroom fan ran continuously.